As a personal finance blogger, I have been telling in almost every retirement focused blog post that the bets thing you could do for yourself is to save away money in retirement fund, aka 401(k) or 403(B). When I received this guest post I was about to reject and send an apology email to the author. But I took time to read it and it started making sense. He’s not asking you to stop investing in 401(k) but he’s mentioning some of the hidden flaws of the system and possibly he’s also motivating you to use every kind of retirement assets, like IRA, Roth IRA, Annuities, etc along with 401(k). Enjoy the post! For many millions of people, a 401(k) plan is seen as the ultimate security blanket. It’s the proverbial pot of gold at the end of the employment rainbow. But is that really what it is? 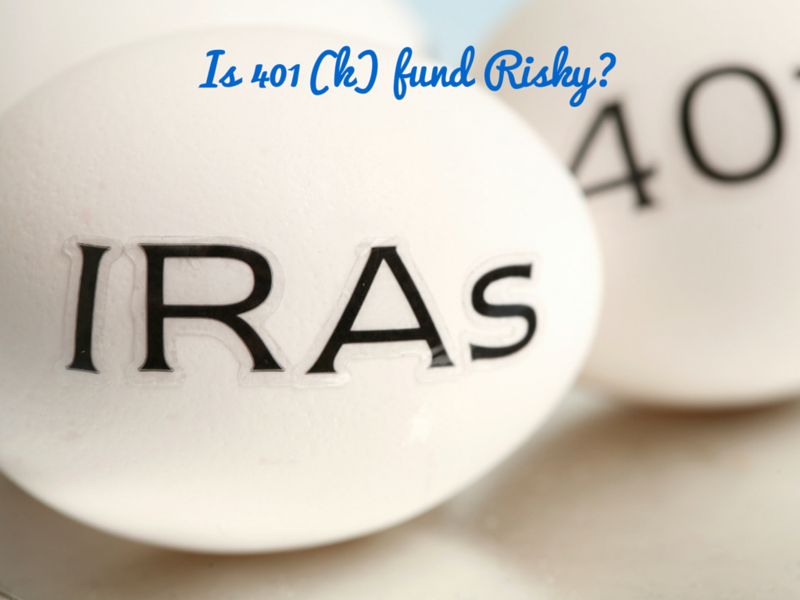 If that’s what you believe, here are 10 reasons a 401(k) is a risky investment. Unconsciously at least, many people don’t fully appreciate the difference between tax-free and tax deferred. Tax free means no taxes – ever. But that’s not what 401(k) plans are. 401(k) plans are tax-deferred. That means that even though there are no tax consequences between now and retirement, there is a liability waiting for you when that hallowed day arrives. The general assumption is that this will have a very mild impact, since the likelihood is that you will be earning less money in retirement than you are right now. Due to having multiple income sources, you may be making more money in retirement than you are now. Even if you aren’t, marginal tax rates may be much higher when you reach retirement than they are right now. This can even extend to the elimination of certain popular deductions. Either way, the blind faith placed in the tax benefits of 401(k) plans could go horribly wrong. This is an inherent limitation of virtually all tax-sheltered retirement plans. You could sustain a major loss – amounting to tens of thousands of dollars – and not be able to deduct a single dollar of it. This problem is much more pronounced during bear cycles in the stock market. Such time periods can lead to double-digit losses over two or three years. And while there may be some consolation of taking capital losses in taxable accounts, no such advantage exists in retirement plans. When people are filling out financial statements, where they record their personal assets, they will generally list their 401(k) plan at face value. For example, if you have $100,000 in your 401(k) plan, that will be the number that you put on the paperwork. In virtually all cases, that’s a gross exaggeration. The reason that it is, is because you are recording the gross value of the 401(k), and not for liquidation value. Liquidation value is what the account will be worth if you had to empty the account today and convert it to cash. If you have to liquidate the account, it will be subject to income taxes. If your federal marginal tax rate is 28%, and your state income tax rate is 7%, you have a combined marginal tax rate of35%. But unless you’re 59 ½ or older, you’ll also have to figure a 10% early withdrawal penalty tax into the mix. That means that fully 45% of your 401(k) plan would disappear to income taxes upon liquidation. That would give you a liquidation value of just $55,000 on a 401(k) plan with a gross value of $100,000. The liquidation value of your 401(k) then, would be no more than 55% of its gross value. Generally speaking, it is impossible to take money out of the 401(k) plan unless you leave your employer. At that point you will have the option to liquidate the account to provide funds for other purposes. Once you do, you’ll be subject to the tax haircut that we just discussed. You can always borrow against your 401(k) plan – if the plan provides for it. If you do, you will be limited to no more than 50% of the plan amount under federal law. And once you take the loan, you’ll be subject to monthly payments. If you can’t, your employer will be required by law to report the loan as a distribution from the plan. Once again, refer to the tax consequences of the 401(k) plan early withdrawal discussed in #3 above. This is an outstanding reason to avoid 401(k) plan loans except under very limited circumstances. Let’s face it, your employer provides services, or produces widgets, or some other economic function. That means that your employer is not an investment broker. That arrangement is usually reflected in your 401(k) plan. Which is to say the 401(k) plan is, for the most part, an afterthought. Unlike a self-directed IRA plan, the typical 401(k) plan contains very limited investment options. In fact, you may have a choice between no more than five or six mutual funds in your entire plan. There may be one fund that represents domestic stocks, one for international stocks, one for technology stocks, a growth and income fund, and some sort of stable value fund. That’s one fund in each category, and it may not even be competitive compared to its peers in the industry. There will be no provision for real estate investment trusts, commodities, small-cap stocks, or any other special situation investments that you may be interested in. The net result of this limited choice will most likely be a below market investment performance. Many employees simply hold their nose and live with this outcome, You’re happy simply to have a 401(k) plan. But a slow growth retirement plan is a limited benefit at best, particularly in a world where inflation is the rule, not the exception. One other problem that 401(k) plans are notorious for having is high investment and management fees. This is another area where employees try hard to look the other way, but it has a real impact on your long-term investing performance. A difference of just 1% in annual fees can be enormous. For example, if you have investment portfolio with $100,000 earning an average of 10% per year, after 30 years the account will grow to nearly $1.75 million. But if you deduct 1% in fees from your return, your annual average is now 9%. $100,000 invested over 30 years at 9% will grow to nearly $1.33 million. That’s $420,000 less than if you were investing at 10% per year – just for a 1% difference in net return. Fees matter, especially when you are a long-term investor. And that’s exactly what you are with a 401(k) plan. Most people take it as an article of faith that the government will always honor the current tax deferral arrangement of 401(k) plans. But all around the world, government finances are becoming increasingly shaky. As they do, governments look to unconventional sources of revenue to shore up their finances. Admittedly, it’s pure speculation, but how long will it be before the government will begin eyeing the trillions of dollars currently held in 401(k) plans as a source of future revenue? Such a move can take a variety of forms. One could be a temporary tax, where the government will take a fixed amount – maybe “only” 5% or 10% – and promise to never do it again. Another might be to impose a tax that seems inconsequential. This can take the form of a permanent tax of 1% or 2% on either all 401(k)s, or all 401(k)s over a certain minimum balance. Still another would be a surcharge added to plan withdrawals. However it plays out, once the tax-401(k)-plans genie is let out of the bottle, it will be just the beginning. And once that happens, the entire 401(k) arrangement will have been altered forever. And in a totally negative way. Temporary taxes have a way of becoming permanent. Small taxes have a way of becoming large taxes. Once it starts, it won’t have a happy ending. The 401(k) concept looks like one of the most brilliant of all human creations in rising stock markets. But when the markets reverse, millions of people get burned. The conventional wisdom is that you should not worry about market declines in a 401(k) plan, because you have decades to recover losses. But what happens if you’re within five years of retirement? Or worse, what if a stock market crash happens shortly after you retire? At that point, you no longer have decades, or even years, to recover the losses. You need income now, and chances are you’ve arranged your retirement portfolio to provide you with a certain level of income for the rest of life. Those income withdrawals – in addition to the decline in your portfolio equity – can deplete your account rapidly. All of a sudden the retirement that you thought was guaranteed isn’t so certain. Now you have to scramble for options at a time when they are few and far between. You may even have to un-retire! Unfortunately, most people have most of their financial assets sitting in their 401(k) plans. It could easily be 70%, 80%, 90% or even close to 100%. That being the case, all of the risks discussed above are magnified. When most of your money is sitting in an investment vehicle – one that you consider to be highly secure – and that turns out to not be the case, you are extremely vulnerable. If diversification is the first rule of investing, then the average American is violating that rule by having most of their money sitting in a single plan – their 401(k) plan. It may be convenient, it may be easy, and the strategy may be endorsed by 95% of the financial universe, but that doesn’t make it safe. Any time that you have most or all of your eggs in one financial basket, you are at greater risk than you can imagine. People find that out every few years – when there is a stock market crash. But curiously, when the market starts to rise again, they forget all about it. But forgetting about it doesn’t make the risks go away. If you have most or all of your money sitting in your 401(k) plan, you’re playing with fire. The inability to deduct investment losses is perhaps one of the biggest points. Great article to open people’s minds on this topic.